Let me preface this entire article with saying that I’ve always been mystified by the cosmetic voodoo that makeup artists, and skilled makeup devotees alike, can manage to pull off when using a simple combination of paints and brushes. Like seriously, seriously mystified. You see, I’m a five minute makeup kind of girl. For very special occasions, I’ll dip my toes into the world of liquid eyeliner (and immediately regret it.) So when it came to the idea of the tools you need to master contouring, I knew I had to reach out to someone who knew what they were talking about. Because if I tried to contour, or tried to even talk about contouring, I’d wind up sounding like a complete foreigner. So I turned to makeup artist Megan Nichols, so she could school me in the art of contouring. “Contouring has blown up in the past year or two,” Nichols says. “If you’re attempting to contour with the wrong tools, you can wind up looking a little tragic. As is true with any makeup trend, it’s important to adjust the trend to fit your own personality, skin, and daily routine." Nichols assured me that yes, even I could master contouring if I wanted to give it a shot. "It's not as complicated as it might seem," says Nichols. "With the right combination of brushes and a little bit of practice, you can get your Kardashian on." Below, Nichols recommends her favorite tools for getting the job done right. "Synthetic brushes usually give me the best application for foundation," Nichols says. The first step to any level of makeup perfection when it comes to your face is always a great base layer. "Foundation that works with your skin is worth the investment," Nichols says. "And a brush to apply it evenly will change the way makeup looks and feels on your skin." Once you've applied your foundation, blending is key. Nichols likes to use the mini beauty blenders, because they give her "a little more control over blending than the larger version." Used to blend foundation and concealer, Nichols says these marvels are perfect for diminishing the visibility of circles under your eyes. Dabbing on the right amount of color to your cheeks can be tricky, but not with this domed blush brush by Nars, says Nichols. "It applies and blends color flawlessly." 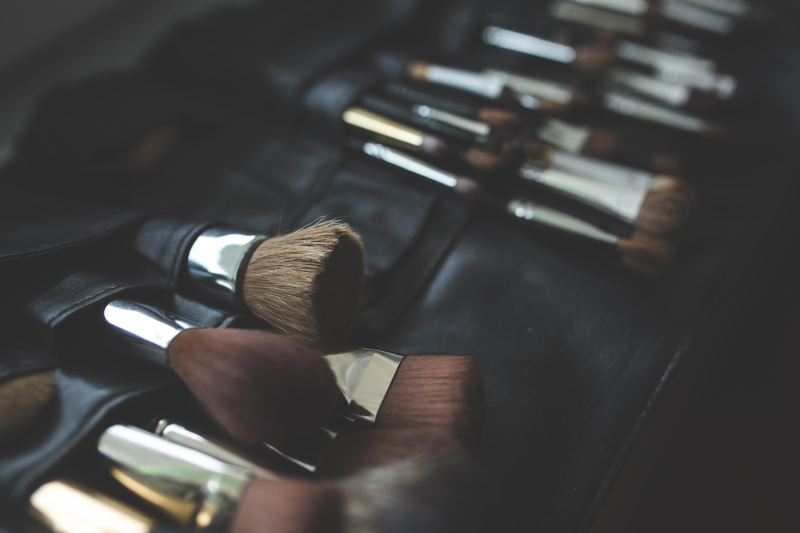 "When you contour, you use a both a bronzer and a highlighter, and a double ended brush is perfect for the job," Nichols says, adding that it's a great way to get two tools in one. To use the tool properly, she recommends using the larger ends on the forehead, nose, and cheeks, and the smaller end for more detailed areas, "like your brows and under your eyes." "Too much powder can make or break your look," Nichols says. That's why she loves this light coverage brush by Dior. "It's made of natural hair, and is perfect for loose setting powders." "This brush mimics a fingertip, and makes applying shadow very easy," says Nichols. "You want to define your eyes with shadow when you get into contouring, or they'll get lost in the canvas of your face!" "People often forget about defining their mouths when they get into contouring," says Nichols. "But defining your lips can make a huge difference in the way your face looks." "Don't let the number of brushes scare you," Nichols says. "With practice, experimentation, and determination, you'll be well on your way to a perfectly contoured face!"